If you don't experience a radical paradigm shift and visible results after listening to this material and going through the exercises, you can return this program anytime within ONE YEAR and receive a FULL REFUND of the purchase price. No questions asked! You can return The Abundance Paradigm anytime within ONE YEAR and receive a FULL REFUND of the purchase price. No questions asked. P.S. How easy is it to change your paradigm from scarcity to abundance? How easy is it to unleash the Law of Creation? It couldn't be any easier! I've designed it to work on levels below the conscious mind, to affect deep inner change just by listening to my voice. That's right! All you have to do listen. Click on the link below now, take The Abundance Paradigm for RISK-FREE test drive, and find out for yourself! 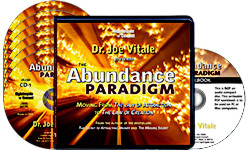 Please send me Joe Vitale's 6-CD audio program The Abundance Paradigm: Moving from the Law of Attraction to the Law of Creation, plus the writable PDF workbook, to try for just $59.95, which is $30 OFF the regular price, with FREE SHIPPING. My order today is completely RISK-FREE! If I don't immediately see and receive MORE of what I want after using these techniques, I can return the program any time within ONE YEAR for a full refund of the program price -- no questions asked!